Kyanite is a blue silicate mineral typically lined with gray and white which forms distinctive brittle crystals. Some kyanite pieces are light blue, while others are darker blue; most specimens exhibit a range of blue shades. 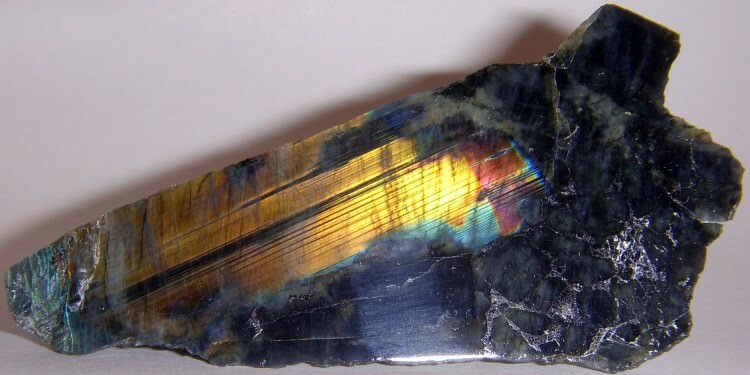 Typically the stone is translucent, but full of inclusions. This makes it glassy in some spots and cloudy in others. If there is a lot of white in a piece of kyanite, it may have a kind of “icy” appearance. Prehnite is a beautiful and unique mineral with an unusual glassy texture which occurs in an array of pale green hues. While it is not the most well-known gemstone, it does make a wonderful choice for jewelry, and it looks great in any mineral display case. Read on to find out more about this striking gem! 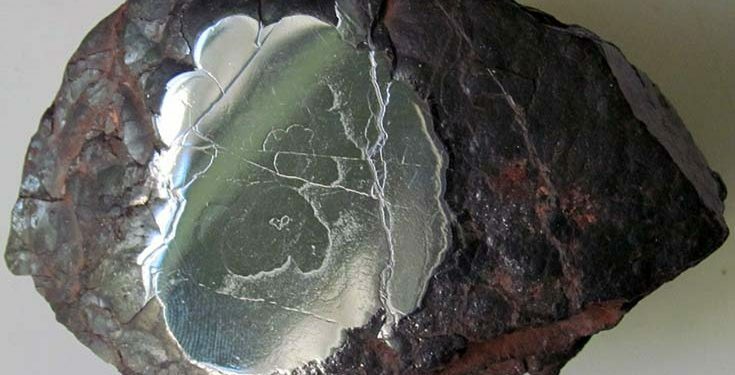 Hematite is perhaps one of the most recognizable minerals in existence. As the mineral form of iron(III) oxide, it comes in several different colors, ranging from steel gray to red or reddish brown. 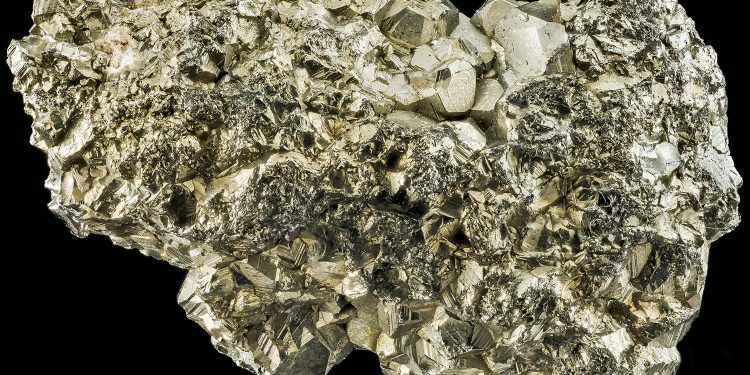 It is renowned for its distinctive metallic luster. 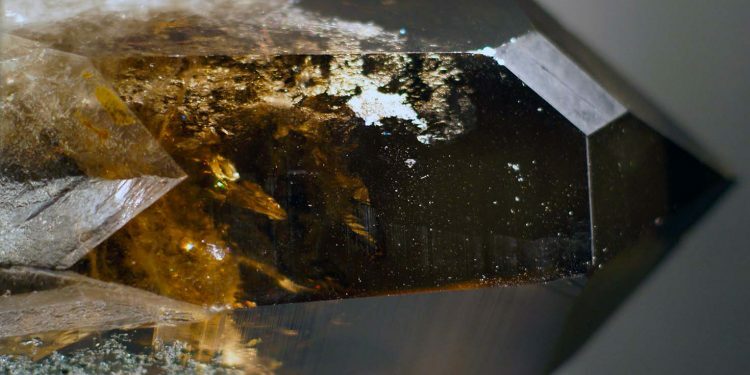 If you have ever looked through the quartz selection at a rock shop and spied a dark grey, brown, or black variety of quartz, you may have seen a specimen of smoky quartz. Smoky quartz is a popular form of quartz for jewelry and general collecting purposes, and is a close relative of another form of quartz called citrine. If you are looking to add a gemstone to your collection which will definitely turn heads, search no further than moonstone. Moonstone is quite a remarkable stone, exhibiting a distinctive visual effect unlike any other. As you turn it in your hand, an ethereal sheen skips across the surface. 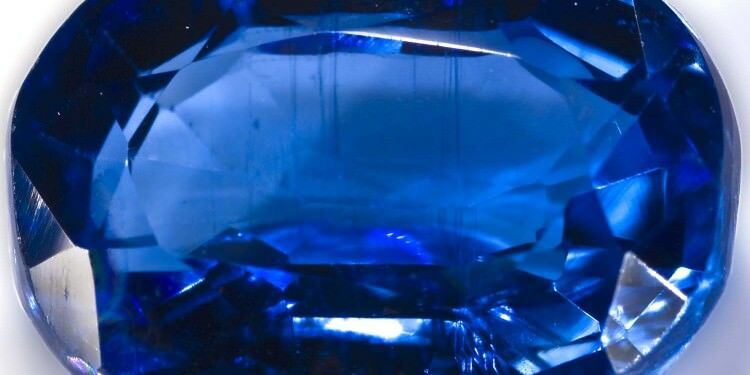 This sheen may even appear to glow, often with a ghostly blue hue. 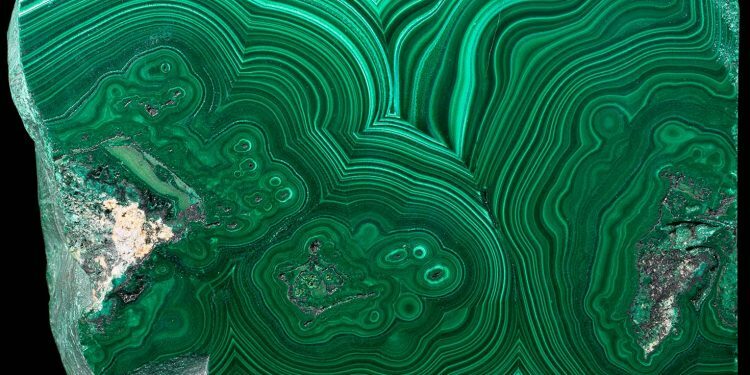 Malachite is probably one of the most recognizable minerals around. When you walk into a gem store, you can’t miss its bright, vivid green color or its distinctive bands. If you want to learn more about this distinctive gemstone, you are in the right place! Maybe you remember as a kid finding a shiny golden rock in the wilderness and holding it up in wonder and excitement. “I’ve just found GOLD,” you declared in glee to your parents, who then sadly shook their heads. “No, that’s fool’s gold,” they explained as your face fell in turn. Though it’s not gold it is still a beautiful mineral, click to find out more! If you are a collector of chalcedony, you may be familiar with chrysoprase. While this gemstone may have an unusual-sounding name, it is actually just a form of chalcedony which happens to contain trace amounts of nickel. 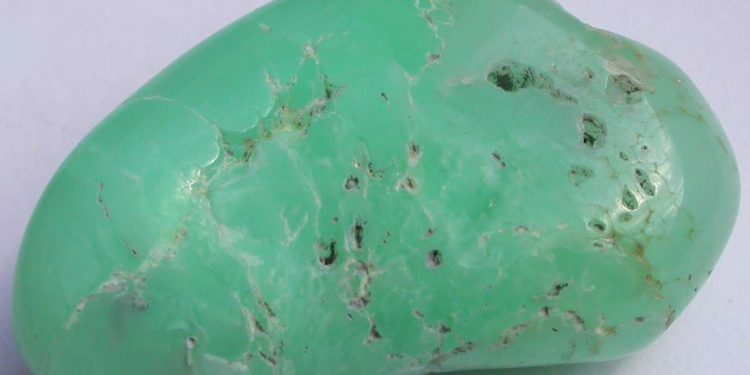 Chrysoprase is translucent and typically has a vibrant apple green color. Click to read our extensive guide! Gemstones have been in the center of attention for thousands of years and in recent years their popularity has only increased. The choices are virtually limitless nowadays: tanzanite, tourmaline in its endless colors, aquamarine, pearls, moldavite, color-changing gemstones like alexandrite or zultanite and many more. The drawback of this increased choice is that many of the gemstones that are becoming mainstream are virtually unknown beyond how they look. Gemcoach strives to change that. Giving all the information you need to make informed choices. We talk about gemstones, but what exactly is a gemstone? The answer is still up for debate, however most agree to this definition: A gemstone is a mineral, rock or an organic material (amber for example) that in rough, cut or polished (cabochon) form is used in jewelry. This is a very broad definition, as everything can be called a gemstone if it fits in a piece of jewelry. However in practice only materials that are extensively used in jewelry are called gemstones. Otherwise the list would become virtually endless. The number of gemstones in existence depends on who you ask. However there are roughly 30 to 50 popular gemstones and up to 200 gemstones coveted by collectors. Some of the gemstones that were only really wanted by collectors have been making their way into the main markets. For example: sphalerite and apatite. Usually the increased popularity comes from a spectacular find, kyanite comes to mind. Though at times it is the effect of a thoroughly planned media campaign. 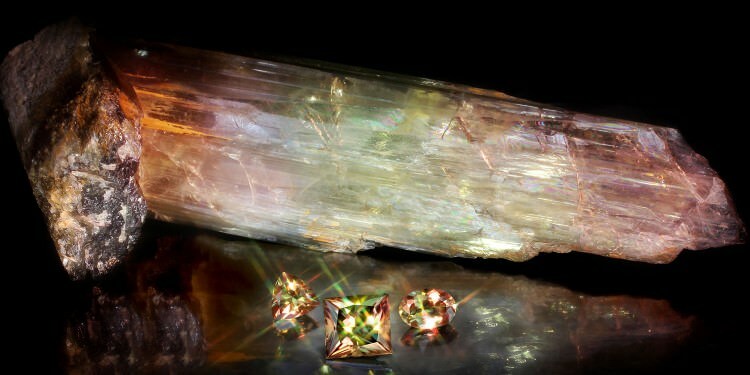 As is the case for zultanite, the trade name for a gem quality variant of diaspore. The list of gemstones is growing almost every year as new types and even species are found. An ever increasing number of people are looking to buy gemstones or, more likely, gemstone jewelry. Because buying gemstones can be very expensive it is important to make sure that the seller is not taking advantage of you. Nothing will feel worse than buying your diamond engagement ring for thousands of dollars and later finding out it was a low quality diamond or not even a diamond at all! Gemstones Advisor wants to make sure you are better prepared to deal with the challenge of selecting the right gemstone dealer or jewelry store. Due to the advent of large scale mining the prices of certain gemstones have dropped rapidly. In some cases to levels where they can be afforded by almost everyone, for example turquoise or pearls. In the case of pearls it was not the effect of mining, as it is not mined, but that they can now be cultured. Which increased the supply dramatically, while cutting cost at the same time. Other gemstones however have rapidly increased in price due to increased scarcity or due to high demand. Ruby and colored diamonds are great examples of this. Because the price is very dependent on factors such as clarity, color and size it is hard to add a price-tag to them. However a general overview of the prices of gemstones and what properties are especially important can be found in the buying guides of individual gemstones. Some gemstones have been in use for thousands of years and likely far longer in some cases. Ancient civilizations like Egypt, China, Greece and Mesopotamia were avid collectors of gemstones. Most of these gemstones had significant religious meaning and were either linked to certain gods or to their placeholders on earth, god-kings such as the pharaohs. Most articles on gemstones will have a small part dedicated to this history, though some will be very short. In particular the newer gemstones have no real history and the focus of the article will be shifted to other, more interesting, topics. Some examples of gemstones with an extensive history are turquoise, lapis lazuli and malachite. Because gemstones have captivated the world for thousands of years it is no wonder that some of them have become famous. There are various reasons for their fame, most of them are simply huge, have an amazing color or are virtually flawless. In other cases the history is as interesting as the stone itself. Just take a look at the history of the Kohinoor diamond. For the truly world-class gemstones it is a combination of all the above. 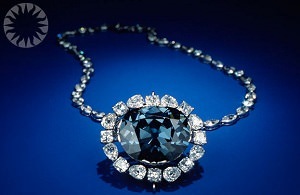 An example of this would be the Hope Diamond which can be seen above. Not only is it one of the largest blue diamonds in the world, it is virtually flawless and has a fascinating history on top of that! As you may have noticed, both examples are diamonds. The fact of the matter is that a large number of famous gemstones are diamonds, a rough count reveals that more than two thirds of the famous gemstones are diamonds! 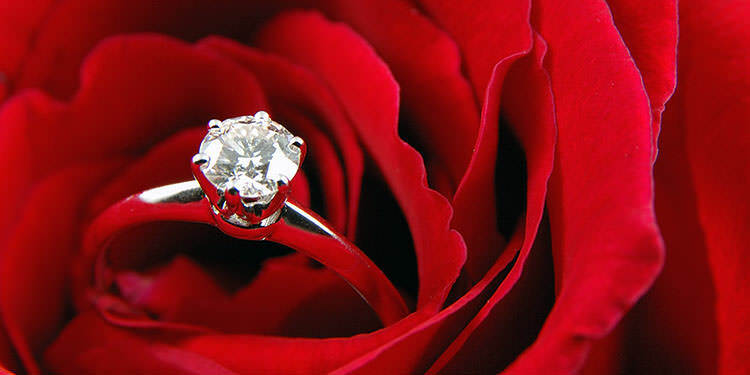 The reason is of course that diamonds currently are the most popular gemstone. 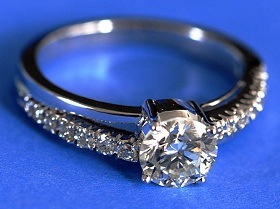 However even in antiquity diamonds were prized for their variety of colors, clarity and beauty. 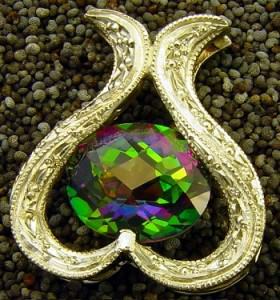 Since ancient times people have attributed special powers to gemstones. In modern times this has decreased somewhat, but there are still hundreds of millions of people that believe in the power of crystals and healing stones. Most stones are linked to certain powers based on how they look. Though some unassuming stones contain great power based on ancient myths in which they play a pivotal role. To find out more about their meanings take a look at our article here: Gemstone Meanings or for an overview of all the individual meanings of gemstones take a look here. The ever increasing popularity of gemstones means that the money that can be made in the industry is also increasing rapidly. This has had the unfortunate side-effect of attracting a less savory type of people. The type of people that are willing to sell you a treated or enhanced gemstone for the price of a regular one. There are certain treatments that are almost impossible to detect, unless using laboratory equipment. However many other treatments and enhancements can be easily seen if you know what to look for. To see through the marketing ploys or straight-up lies a bit of education is required. The following article will help you with just that: Gemstone Treatments and Enhancements. The amount of information on gemstones is staggering and increasing on a daily basis. To help you with your search for knowledge Gemstones Advisor has compiled a shortlist of great resources in the field of gemstones and gemstone jewelry. An extensive database of minerals and gemstones can be found at The Mineral and Gemstone Kingdom. 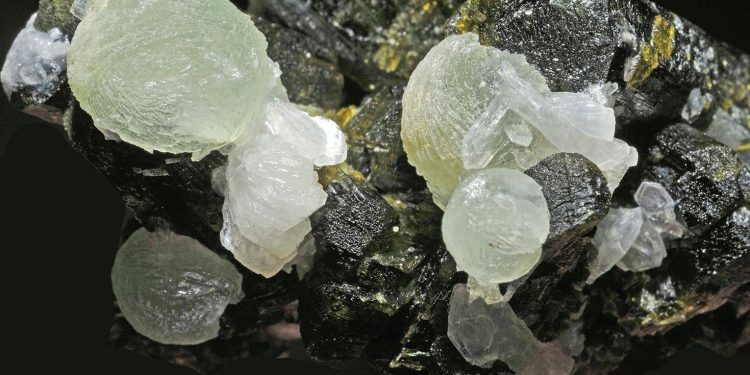 It features most well-known minerals as well as a large number of fairly unknown minerals. Every entry includes the scientific properties. For those that want eye-candy, a photo gallery is usually included as well. The Gemological Institute of America (GIA) is well-known in the world of gemstones and gemstone jewelry. Their focus lies on protection of buyers and sellers of gemstones through education of the public and the training of experts. Their research of synthetic gemstones and new gemstone treatments is considered the best in the world. If you have a question you haven’t been able to find an answer to you can try the Gemology Online forums. It is one of the oldest and most renowned forums on gemstones and everything related. Of course if you have questions you can also contact us. We’ll find you the answers you need!